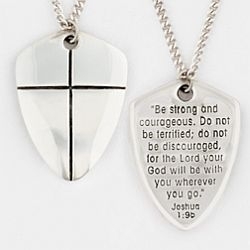 This beautifully made sterling silver necklace is a reminder that God is with us no matter what we face. 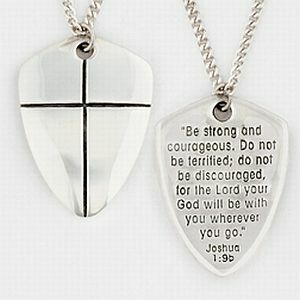 The shield features a cross on the front and the verse from Joshua 1:9b inscribed on the back. 20 inch curb chain. Small necklace and matching rings also available. Text: Be strong and courageous. Do not be terrified; do not be discouraged, for the Lord your God will be with you wherever you go. Joshua 1:9b.